Paul Craddock's village in rural Devon has endured despite the heartbreak and sorrows of war. The landowner and his family have also known their share of loss. But now, as England struggles to rebuild in the aftermath of World War II, he and his wife, Claire, and their children confront new perils. With his livelihood threatened by emerging property laws and his family divided over the future of his beloved Shallowford estate, Craddock struggles to preserve his legacy. For his sons and daughter, the fifties and sixties will be a time of discovery and change that will resonate in the lives of their own children. The final novel in Delderfield's magnificent trilogy pays tribute to the courage and unflagging optimism of British villagers trying to keep step with modern times even as they cling to the traditions of a bygone world. 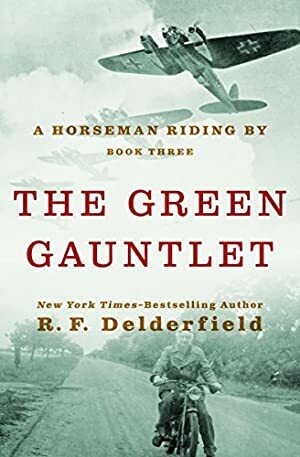 The Green Gauntlet is the third novel in R. F. Delderfield's saga A Horseman Riding By, which begins with Long Summer Day and continues with Post of Honour. Log In to track R. F. Delderfield on eReaderIQ. to be notified each time the price drops on any book by R. F. Delderfield. to stop tracking R. F. Delderfield. We started tracking this book on July 2, 2014. The price of this book has changed 73 times in the past 1,752 days. The current price of this book is $8.99 last checked 23 hours ago. The lowest price to date was $1.99 last reached on March 22, 2019. This book has been $1.99 14 times since we started tracking it. The highest price to date was $11.99 last reached on May 12, 2018. This book has been $11.99 2 times since we started tracking it. We last verified the price of this book about 23 hours ago. At that time, the price was $8.99. This price is subject to change. The price displayed on the Amazon.com website at the time of purchase is the price you will pay for this book. Please confirm the price before making any purchases.